Brandon has seen it all. His people dying, being terribly wounded and crippled for life. Dead civilians. The war taking place in living rooms. He’s done his job. He returns from a completed tour of duty in Iraq a hero and now he wants out. Unfortunately he is stop-lossed. 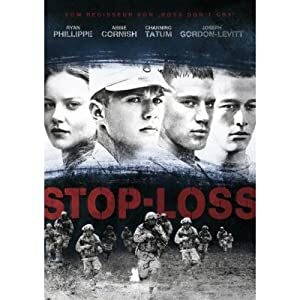 In times of war, when there is no draft and not enough volunteers, the government can stop-loss soldiers, meaning send them back even if they want out. What begins as a war movie with heavy fighting, interspersed with grunt-video like elements, turns now into a road movie. Brandon wants out and goes AWOL. He and his best buddies girlfriend Michelle are taking a trip to… A new life with a fake identity or back to where his friends are? Watch it and you will find out. It should suffice to say that this movie is a character study, a very critical look at what is going on “over there” and a way out of the speechlessness of those involved and those waiting for them. The young men, depicted in this movie are of the kind who rather hit you in the face than voice their uneasiness. They drink, they fight, they like to shoot guns and listen to heavy music. They are self-destructive but loyal friends. They do not have much other professional options but join the army. The movie’s strength is not only to be highly watchable but to convey a deep feeling of sadness. Sadness about many things: the loss of naivety, the governments cheating, the waste of lives and ultimately hope. This entry was posted in Actors, Iraq, Recommendations, Reviews, War Movie and tagged Iraq, Movies, Recommendations, Reviews, Ryan Philippe, War Movies.